I hope everyone had a good weekend! Mine was really great (other than my eBay account getting hacked and needing to be on the phone with customer support before 7am getting it fixed). Saturday night I attended a surprise birthday party for one of my friends, and it was perfect. She was completely surprised, so thrilled, and there was dancing and cake and punch all around. I also did some baking this weekend, and tried out something new. I've had a jar of lemon curd sitting in my cupboard for a couple of months, and it's usually too powerful for me to spread on plain scones, but I got the idea to create a scone-muffin-doughnut hybrid. I mixed up my standard plain scone dough, added about a quarter cup of the lemon curd to it, and then put about 2 tablespoons of dough into each cup on a muffin tin. I then followed that with about a tablespoon of lemon curd, and topped it with another tablespoon of the dough. I'm calling them scuffinuts- the buttery, flaky dough of a scone, the convenient shape of a muffin, and the creamy center of a filled doughnut. They're the right mix of buttery and sweet and tart, and I can't wait to try it out with other flavors. Of course, I also got some knitting done. 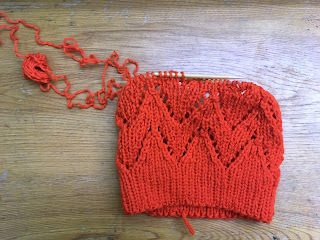 I finished the second lace repeat on my Gorham for my Accessories KAL, and since today is the halfway point for the KAL, I'm right on track to finish on time. I'm loving hearing about people's projects, and I can't wait to start seeing some pictures in the FO thread!